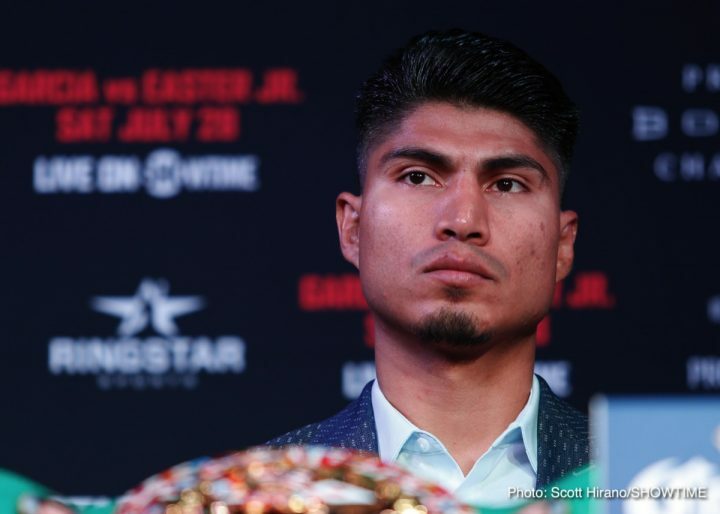 By Dan Ambrose: Mikey Garcia (39-0, 30 KOs) is putting in the hard work in trying to build up his strength at the SNAC facility to prepare for his March 16 fight against IBF welterweight champion Errol Spence Jr, (24-0, 21 kOs) at the AT&T Stadium in Arlington, Texas. Garcia, 31, is still in the strength gaining stage of his training for the fight with the much bigger and stronger 28-year-old Spence. All the various exercises that Mikey is doing to gain strength and bulk almost primitive, and it makes you wonder whether he’s going to be successful. The area that seems to be neglected on Mikey’s body, his midsection, is likely going to be the main target for Spence’s powerful punches on March 16 when the two of them meet up in their fight on FOX PPV. In looking at Garcia’s training, it easy to spot a rather large midsection, filled with fat, and that’s something he’s going to need to get rid of if he’s to have a chance of winning the contest. Mikey has 7 weeks to go before his fight with Spence. That’s not a lot of time for Mikey to trim down and tone up his flabby midsection to get it ready for the punches that Spence is going to be hitting him with in that area of his body. Mikey has spent his entire career fighting head-hunters exclusively. He’s only fought one body puncher in Orlando Salido, and that was in 2013 in a match that ended prematurely after eight rounds after Mikey complained of a broken nose. Salido, 5’6″, didn’t have the height, reach or the power of Spence. It’s going to be a lot harder for Mikey to try and stop Spence from throwing body shots as it was for him to do that against Salido. Mikey was allowed to hold his left arm far out in front of him like a stick all night long to prevent Salido from getting close to throw punches to his body. The referee allowed Mikey to do this, which is obviously against the rules in boxing. That kind of tactic probably won’t work against Spence. If Mikey decides he’s going to stick his left arm far out in front of the entire night, Spence is likely going to hit him with straight left hands to the head, and knock him out. Mikey will probably need to come up with a different plan if he ants to stop Spence’s offense, because he has so many different ways to knockout his opponents. He’s not just a body puncher. Spence can throw with major power either hand to the head. If Spence decides he wants to use his size to work his way in close to throw body shots, there’s not much Mikey is going to be able to do to stop him other than to try and hit him with something while he’s on his way in.